Meet Siiri and Irma, best friends and the queen bees of Sunset Grove, a retirement community for those still young at heart. With a combined age of nearly 180, Siiri and Irma are still just as inquisitive and witty as when they first met decades ago. 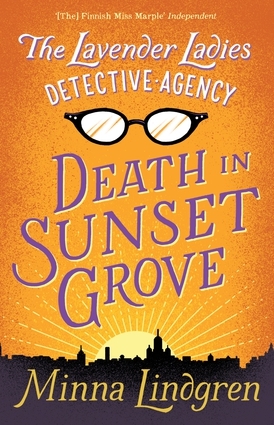 But when their comfortable world is upturned by a suspicious death at Sunset Grove, Siiri and Irma are shocked into doing something about it. Determined to find out exactly what happened and why, they begin their own private investigations and form The Lavender Ladies Detective Agency. The trouble is, beneath Sunset Grove's calm facade, there is more going on than meets the eye, and Siiri and Irma soon discover far more than they bargained for. Minna Lindgren is a journalist and classical music expert. The article which inspired Death in Sunset Grove won the 2009 Bonnier Journalism Prize, considered the highest journalism honor in Finland.